The best tool for most jobs is the one you’re most comfortable with. 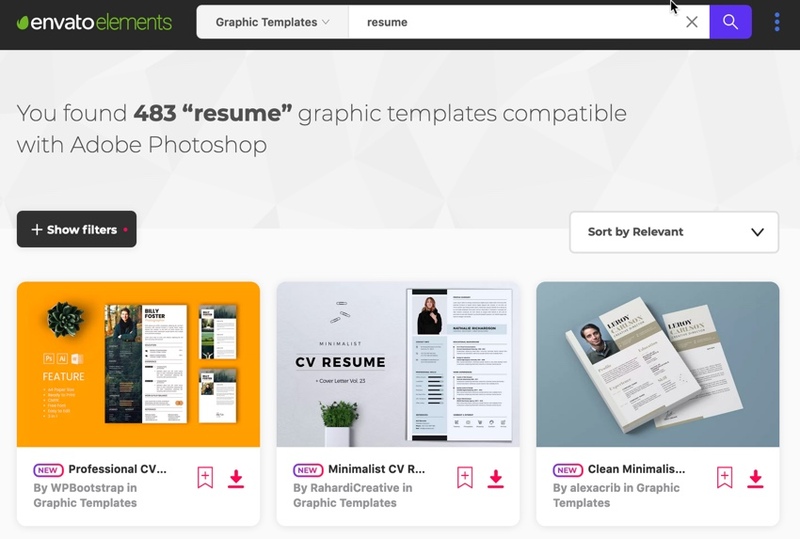 Even if Adobe Photoshop isn’t the ideal tool for building a resume, it’s got all of the tools and features that you need to create a resume that’ll help you land the big job. 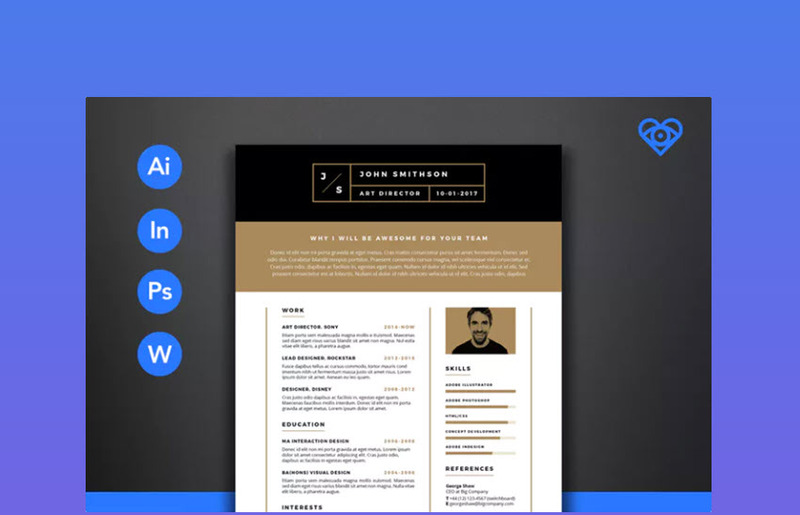 In this tutorial, I’m going to share more than 20 of my favorite Photoshop resume templates that come packaged as a layered Adobe Photoshop (PSD) file. You can grab one of these, add your details, and use it in your application. 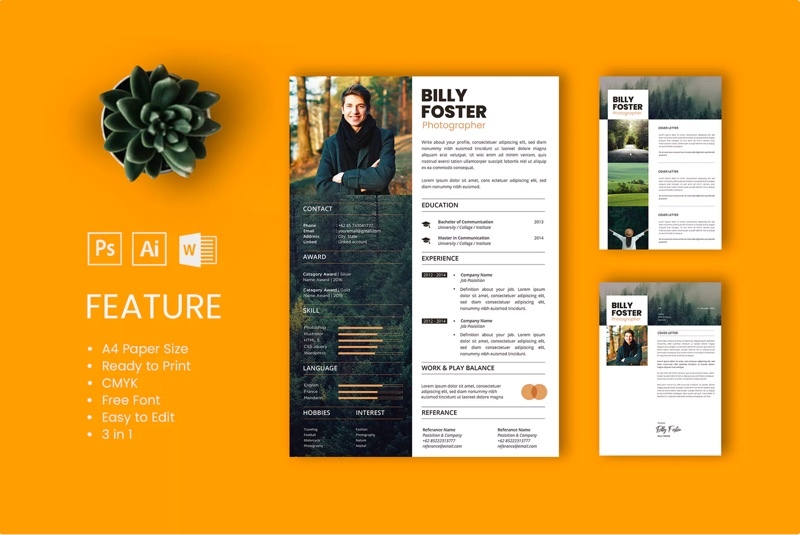 Skip the learning curve of learning a new design app or creating a resume from scratch with these Photoshop resume templates. There’s no reason to start with a blank slate when you’re building out your resume. 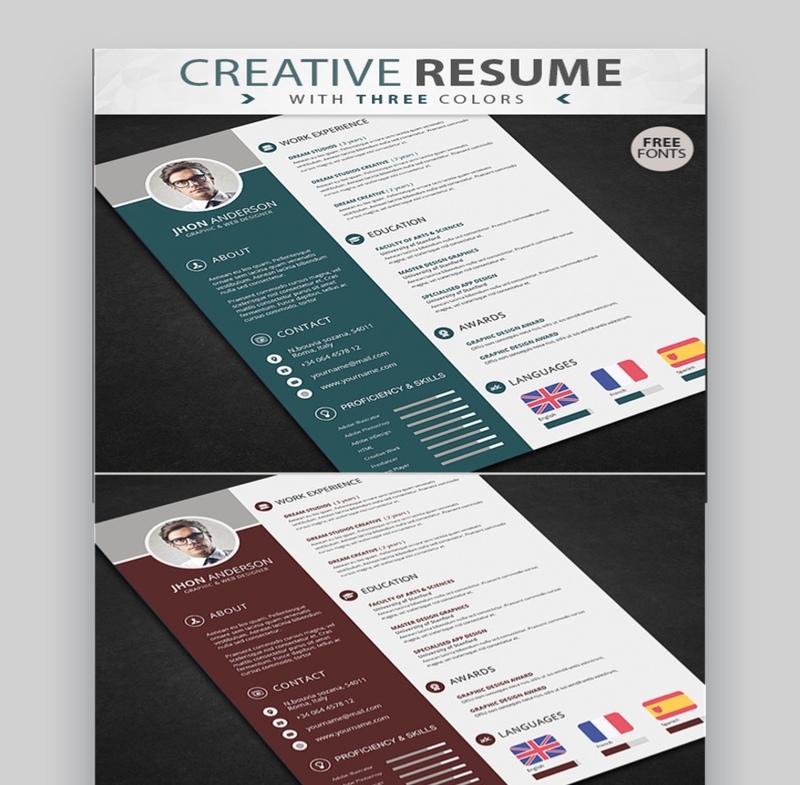 Use one of the resume format templates below to create a great-looking resume with Adobe Photoshop. Let’s check out some of my favorites. 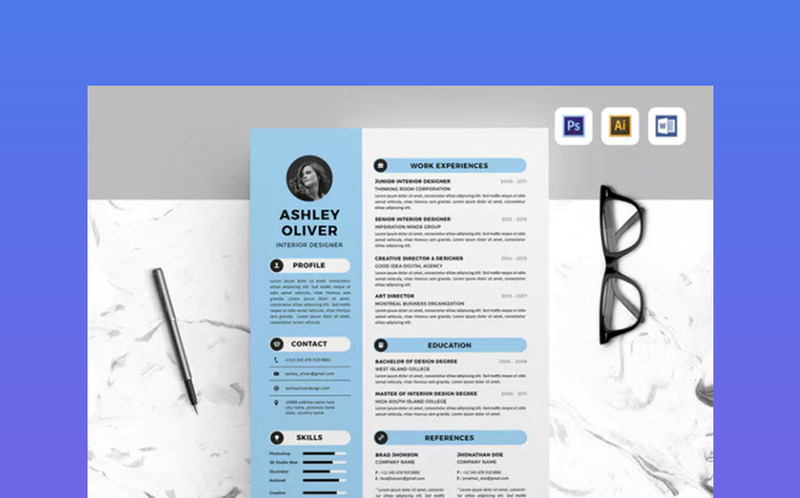 LeafLove’s Ashely PSD resume template is clean and simple, with plenty of room for your profile picture and a brief introduction in the sidebar. What if you work in a data-driven field like finance or analytics, for example? Well, this pack may be perfect for you. 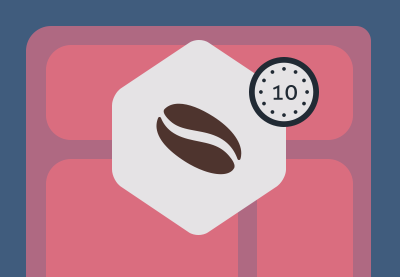 It’s more focused on visualizations and infographics than the other selections in this tutorial, and it certainly has its place in standing out. This file is exceptionally easy to customize and set up in Photoshop. 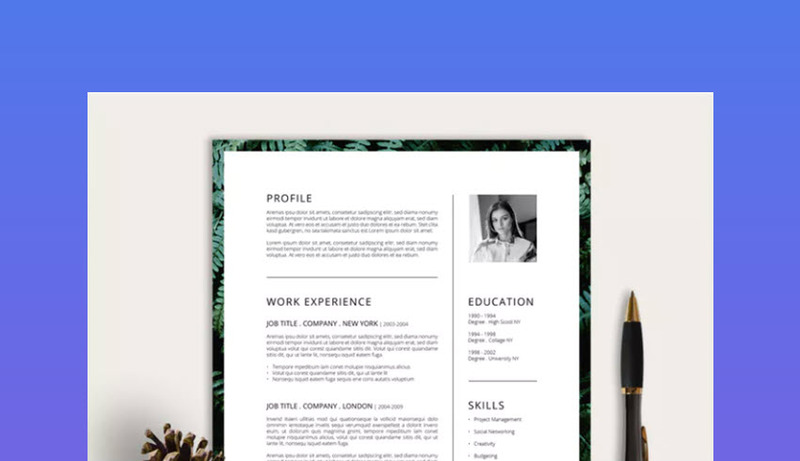 You can change the font and content, but it’s one of the simplest ways to build a professional resume in this entire roundup. 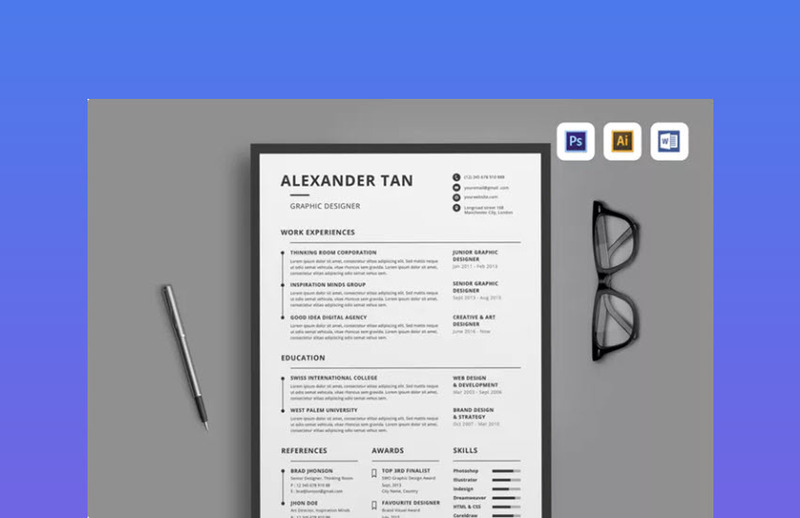 This PSD resume template is another choice that would be more suited for creative jobs and professions than an office job. Also, make use of the circular infographics to describe your proficiency and skills and catch a reviewer’s eye. 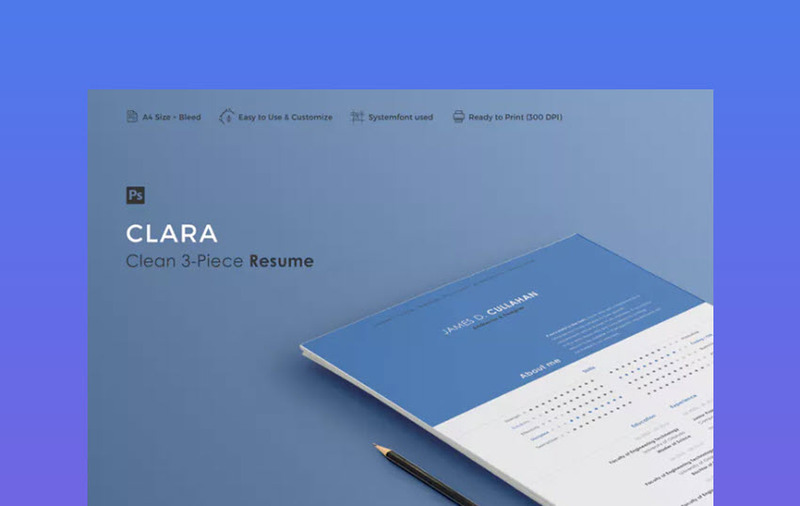 Clara is another sharp-looking resume template that applies to a variety of professionals. 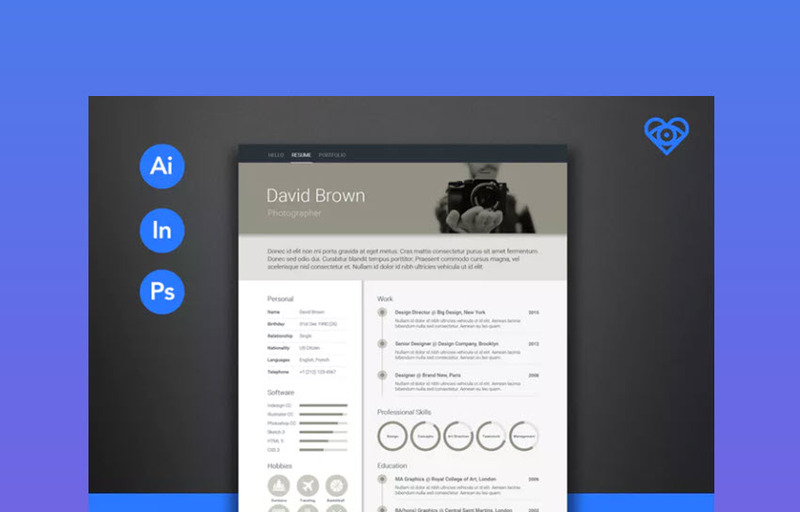 There’s also a nice-looking portfolio template with placeholders for screenshots of your favorite work. Here’s another solid choice for putting your best foot forward when applying. 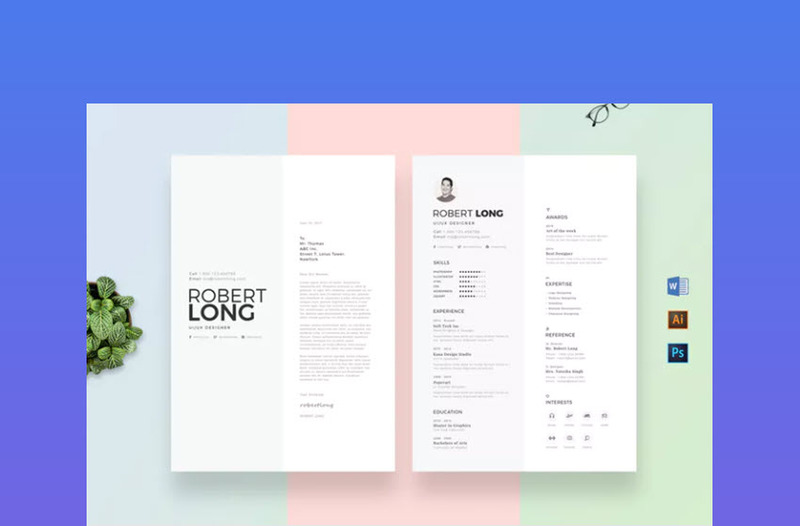 The top part of the resume is reserved for a personal introduction, while there are timeline elements to show your experience. A quick look at this template in Photoshop shows that it’s easy to customize and substitute your color scheme and assets. 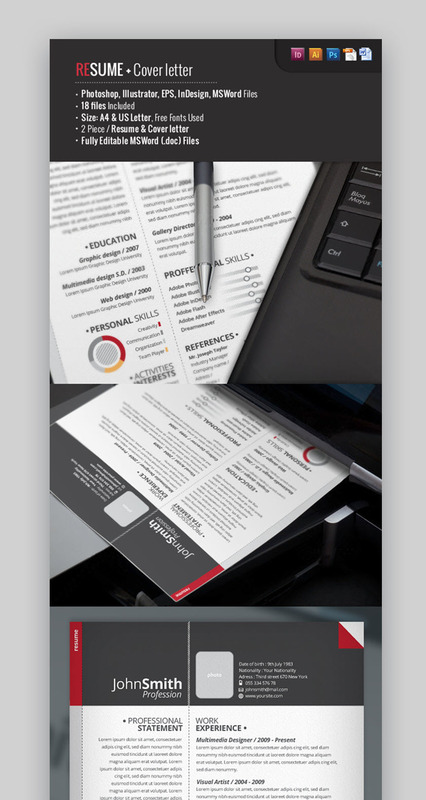 Clean and modern, the Neue Swiss resume has just enough color to help your photo resume rise to the top of the stack. It’s easy to customize if you want to try out another color palette as well. I could see using this for creative lines of work, sure. But I also think it’s clean and professional enough to use with more conservative lines of work as a way to stand out from the crowd. A theme throughout this roundup is that “less is more” when it comes to presenting your experience. In my mind, good design gets out of the way of the content. Again, this is another solid choice that’s a breeze to customize in Photoshop. In my testing, it was also easy to try a different color scheme using Photoshop tools. Reuse this for many purposes. 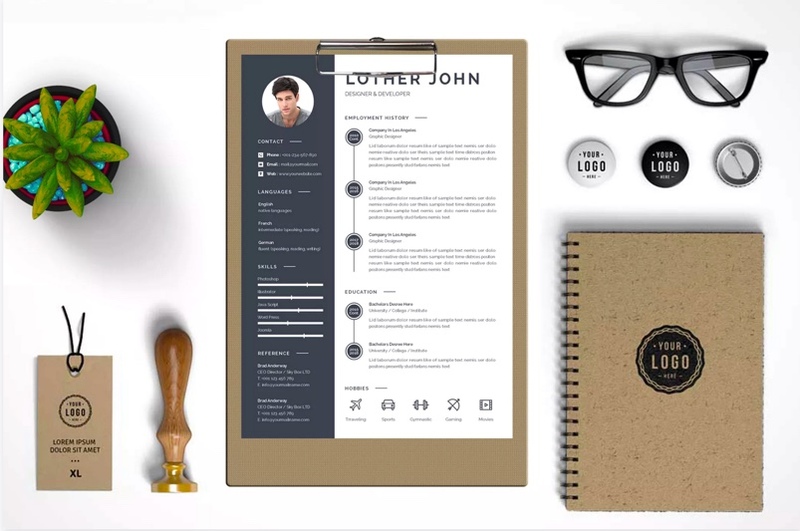 This resume pack is highly personalized and focuses on making an impression on the reviewer. With plenty of room for a profile resume picture as the banner, this one helps an interviewer “put a name with a face” before you ever even come on site. I like Webduck’s approach to building a resume format template, as it features excellent usage of whitespace to highlight your details. 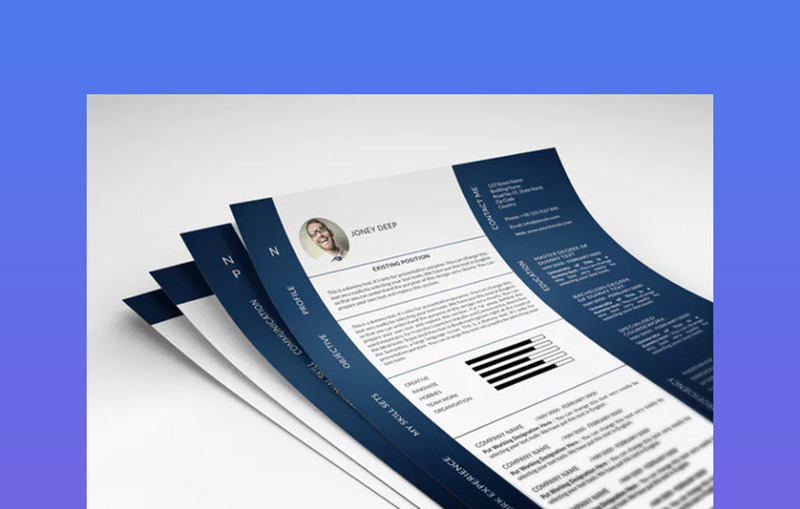 It’s extremely easy for a reviewer to browse your finished version of this resume and glean the important details. 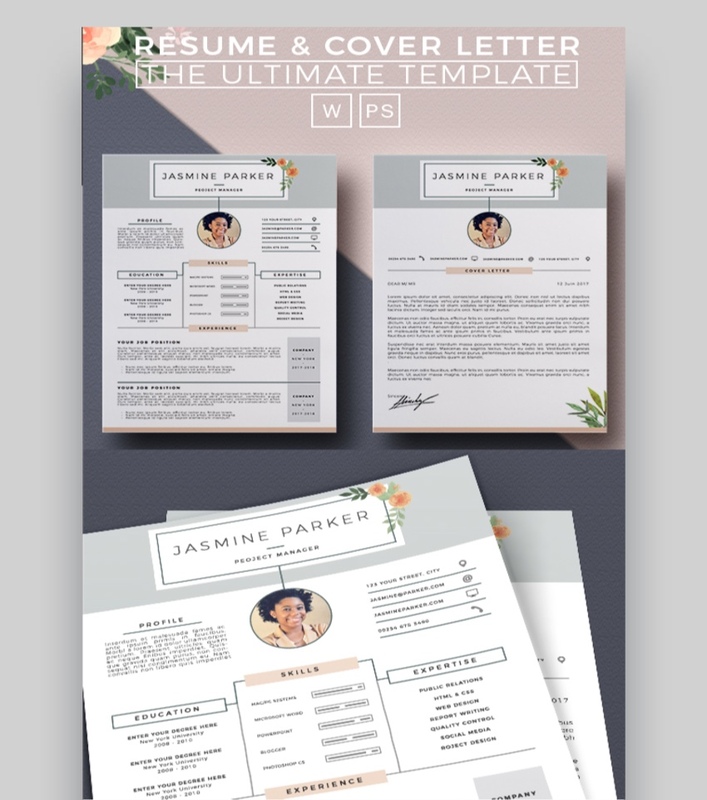 If this light and airy approach isn’t your style, feel free to add a splash of color easily to the PSD file. 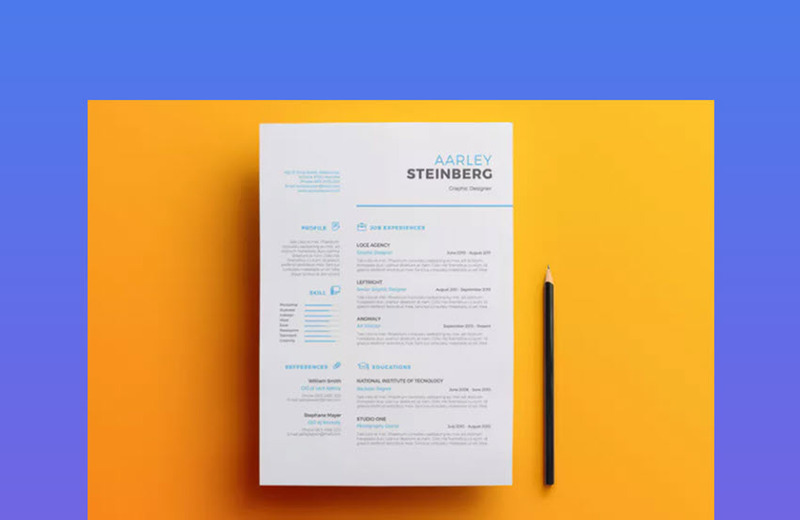 This top-selling resume template is popular for a reason. 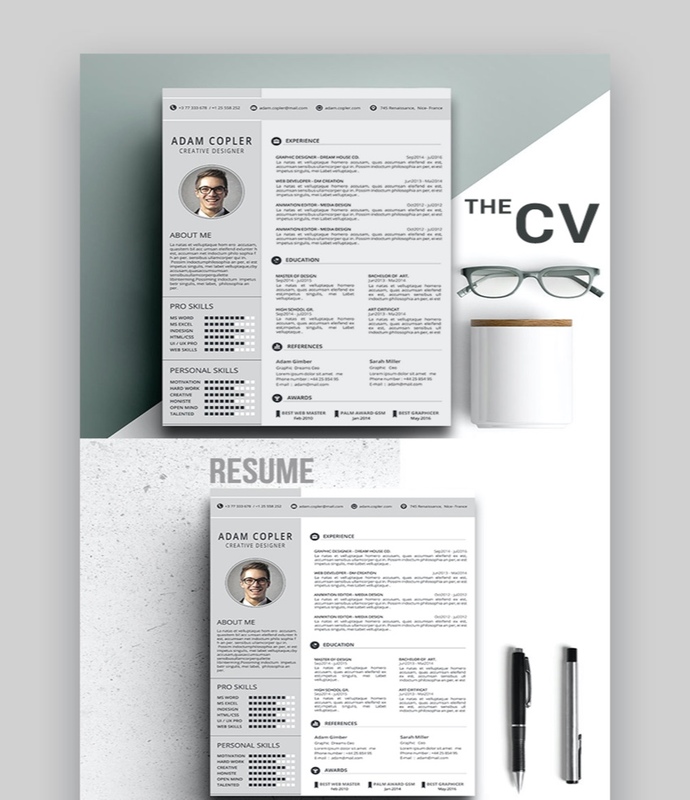 It’s an excellent general-purpose PSD resume template that could be used with a litany of job types. If you’re going to choose just one pack that’s got everything you need, this one might be the choice. 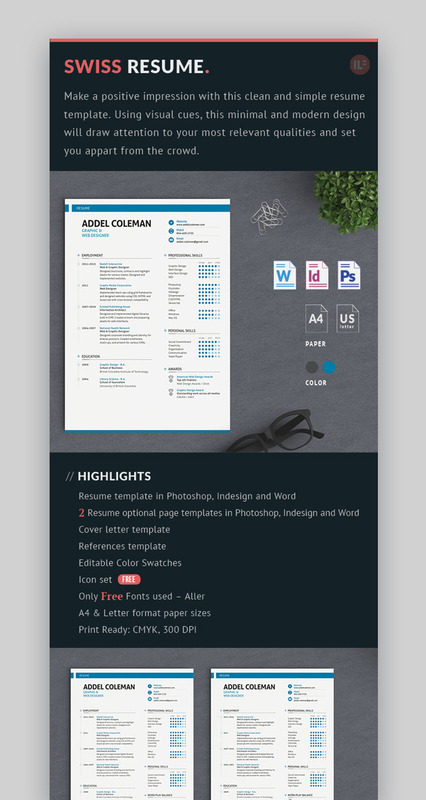 With a selection of cover letters and resume placeholders, it’s a one-stop shop for building a resume in Adobe Photoshop. 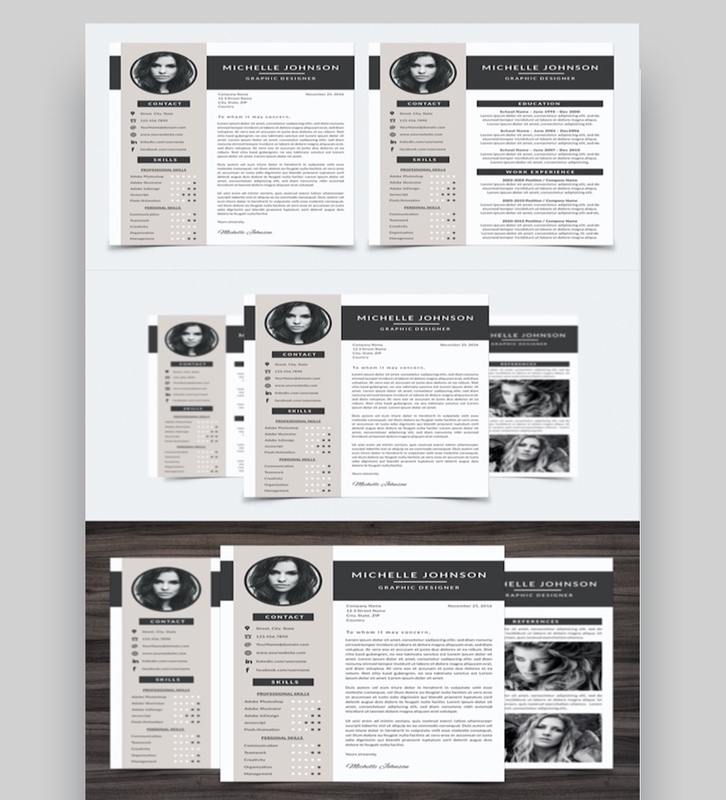 This professional resume template comes with a cover letter template, resume and portfolio template. 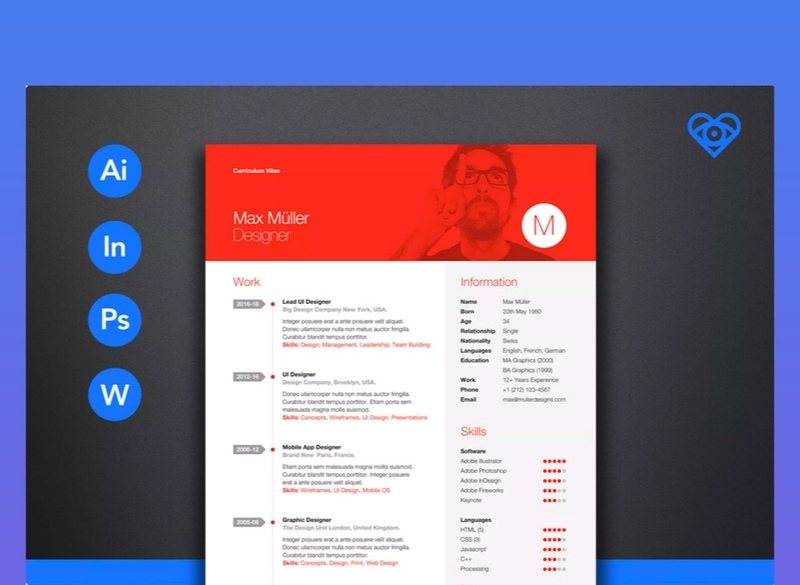 Easily edit this resume template to customize it to the job you’re applying to. You can easily change the colors to any color you would like. 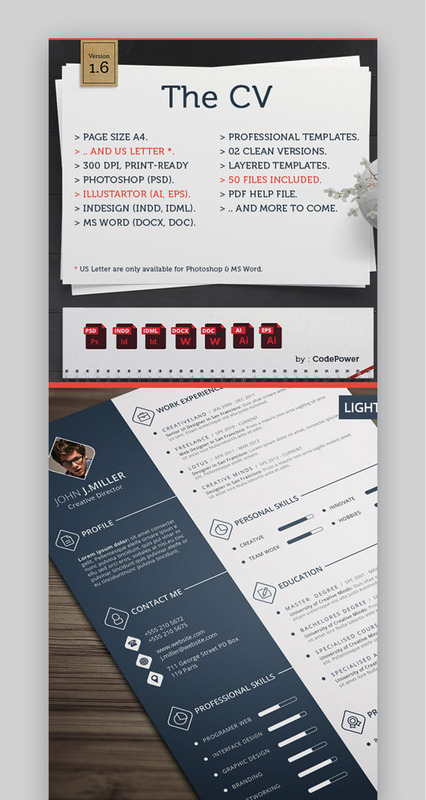 The two pieces of this pack are a great looking resume template with photo and an easy-to-customize cover letter. 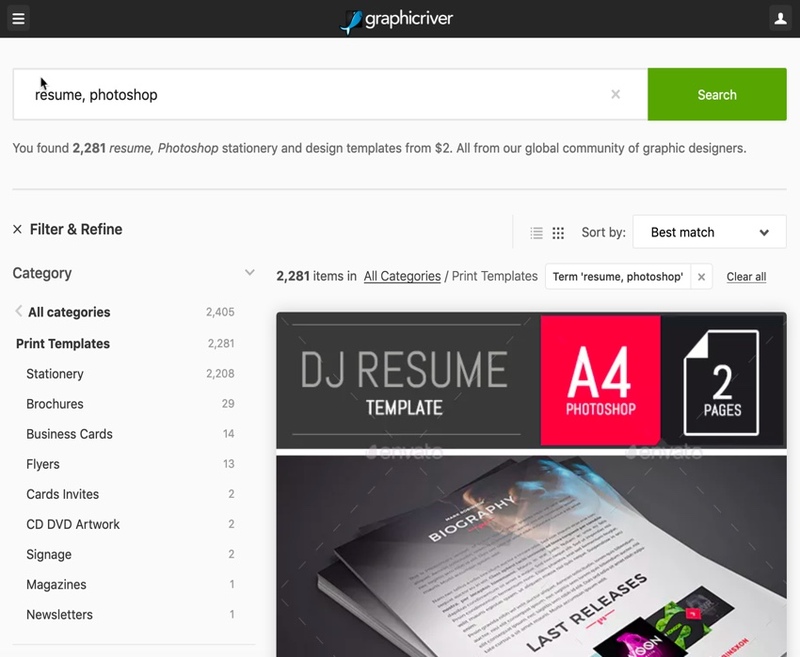 It’s a breeze to customize this in Photoshop with your details or branding elements. Also, drop in your headshot to replace the resume picture placeholder. This document is also CMYK-ready, which means it’s easier to print. 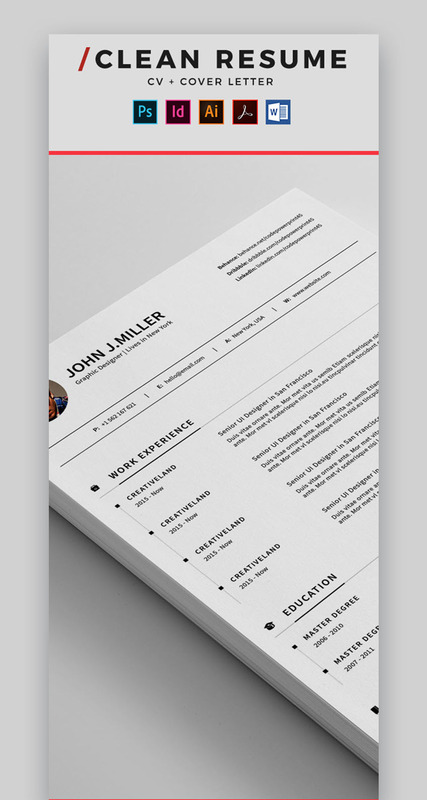 This is a clean and creative resume template. 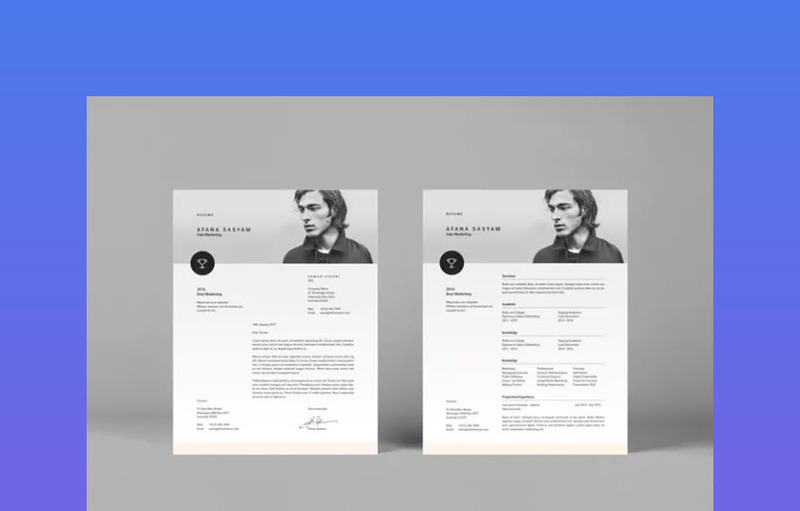 You get a cover letter template and a resume template. There’s an awards section and a language section to show off your skills and achievements. 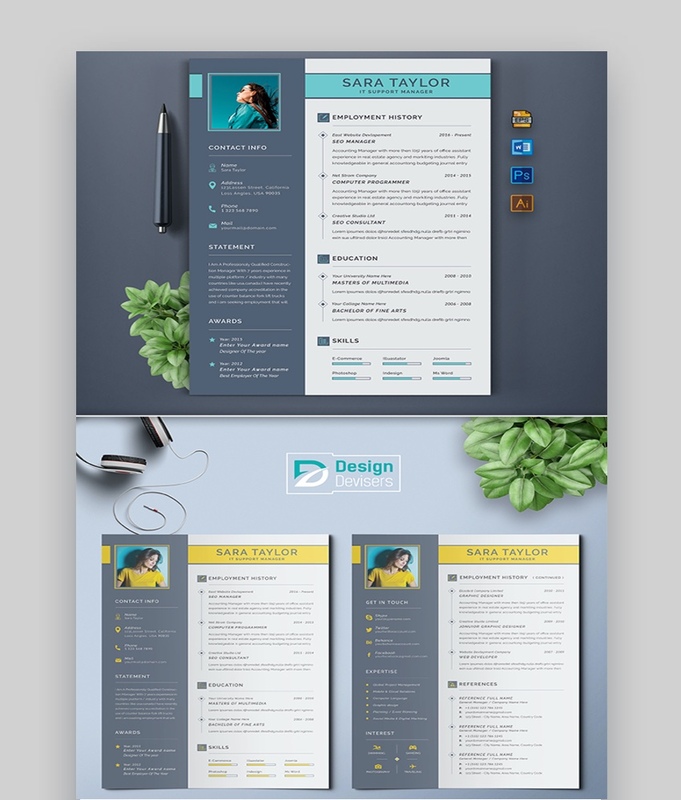 This template also has three different color schemes to choose from. Read the job description you’re applying for very carefully. Then, update your experience to focus on the skills that would make you a good fit for the job you’re applying for. Building out documents like a cover letter or portfolio page are steps that many applicants will simply skip. That’s all the more reason to do them so that you’ve got a chance to make it through the system. Make sure that you present yourself as a professional, but don’t hesitate to share those personal details that’ll make you interesting or memorable to the reviewer. I frequently list a few hobbies that can act as ice-breakers in the interview process. 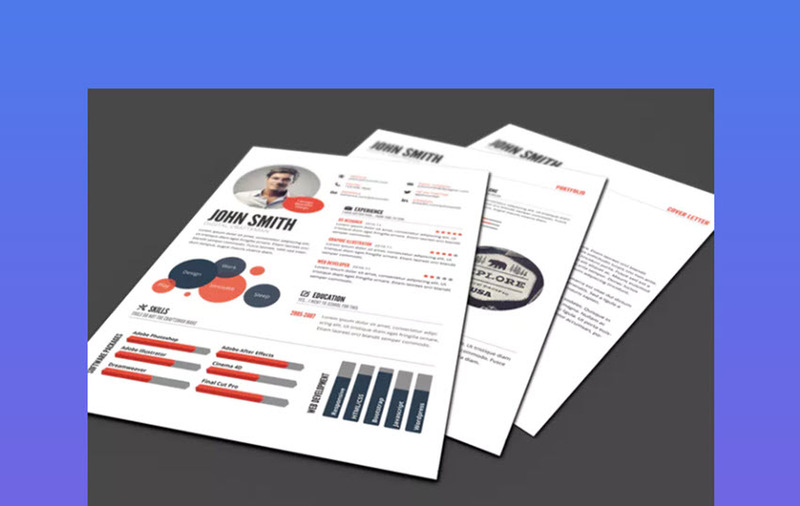 When you’re scrambling to apply for a job, the last thing you should be worrying about is designing a photo resume from the ground up. 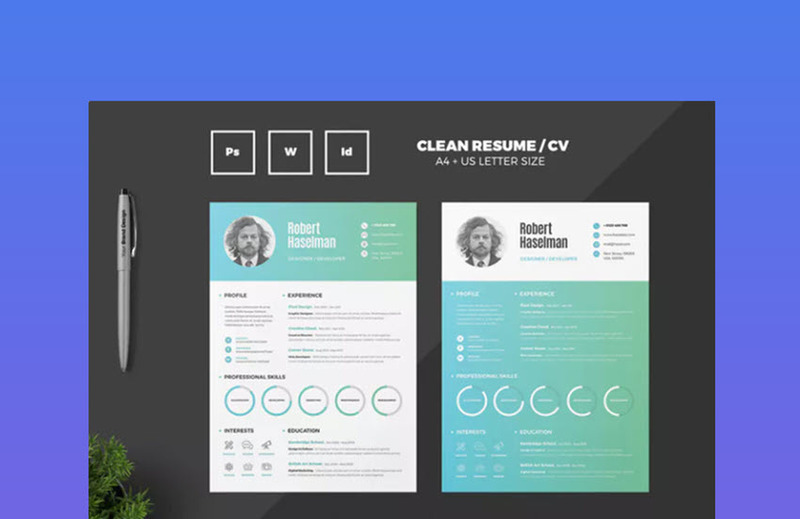 Instead of doing that, skip the time and effort by starting with a pre-built Photoshop resume template like one of the links shared in this tutorial. 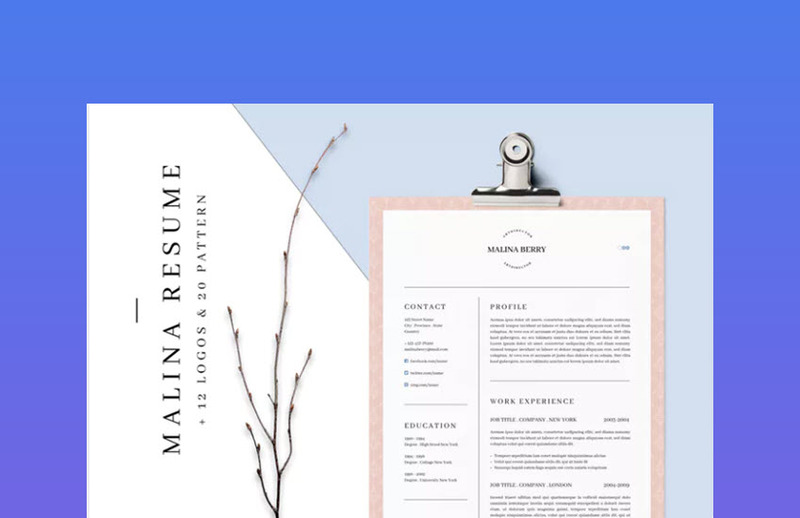 If these PSD resume templates aren’t your style, make sure to check out the all-you-can-download Envato Elements selection, or go and find a specific resume format template from GraphicRiver!